Frosted patterned film is a beautiful and trendy way to give your home windows the privacy it needs. When it comes to bathrooms, privacy is of utmost importance. Our beautiful privacy windows are easy to apply and designed specifically to resolve your glass privacy related problems. 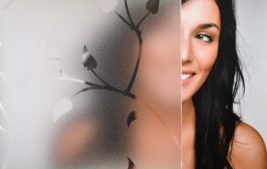 Choose from our extensive range of bathroom privacy films and add an extra layer of privacy to your glass doors.